Millikan High School triumphed at the inaugural Formula E School Series race held recently on some of the same streets that will be used for this weekend’s Toyota Grand Prix of Long Beach. Nine high school teams from the Long Beach Unified School District and one from Santa Barbara took part in a 20-minute qualifying session and 20-minute race on April 4 on the full Long Beach ePrix circuit. The race is designed to encourage young people to get involved in sustainable engineering. 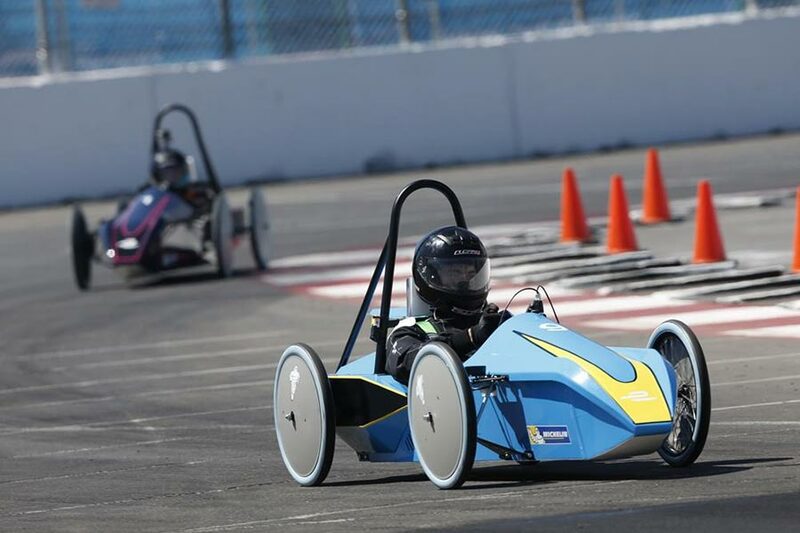 The teams built their electric single-seat cars from kits during a build day at the Long Beach Convention Center the preceding weekend, guided by mentors from series organizers, Greenpower Education Trust and the Greenpower USA Foundation. The 20-minute qualifying session decided grid positions through an energy efficiency formula, so smooth driving was the key. Millikan’s Connor Veliz in car No. 9 mastered the art of efficient driving by qualifying for the pole, or lead position. From there, he led the race from start to finish. The participating schools were the California Academy of Mathematics and Science, along with McBride, Cabrillo, Jordan, Millikan and Santa Barbara high schools. McBride’s Ethan Talamantes and Ryan Jordan finished second and third, respectively. “The race was a huge success, and the enthusiasm from all participants involved has been outstanding,” Greenpower Education Trust CEO Jeremy Way said. The Greenpower Education trust charity was established in 1999 to encourage youngsters to follow careers in sustainable engineering and technology. The Formula E initiative encourages students to learn and develop their engineering skills in a hands-on, fun and competitive environment. More than 500 schools in the UK participate in Greenpower’s domestic motorsport program, and its international appeal is growing, with initiatives being set up in South Africa, Poland and Portugal in the last 12 months. Learn more about the Formula E School Series and Greenpower Education Trust. WINNING CAR – Millikan High School student Connor Veliz guides his electric car to first place in the inaugural Formula E School Series race held recently on the Long Beach ePrix circuit. Teams of students built the cars from kits, learning about sustainable engineering in the process.